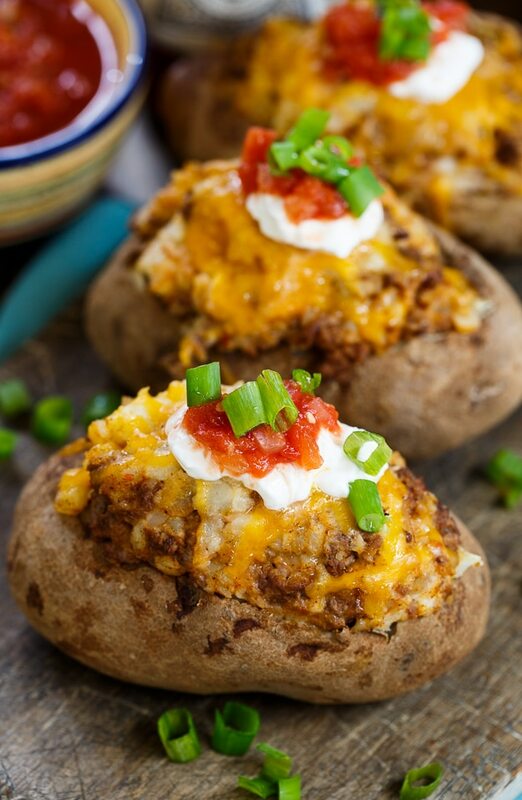 Double Stuffed Taco Potatoes are hearty and filling enough to eat as a main course. They are loaded with ground beef taco filling, onion, sour cream, and cheese. A sprinkling of chopped green onions and salsa finishes them off. 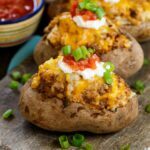 I used a packet of taco seasoning to make these Double Stuffed Taco Potatoes easy to prepare and the seasoning gives the potatoes tons of Mexican flavor. You can vary the heat by choosing either mild or spicy taco seasoning, or you could use a homemade seasoning if you have a recipe you like. I used a pound of ground beef since that is typically how it comes packaged. I added only about 3/4 of the cooked ground beef to the potatoes. I felt the ground beef/potato ratio would be off if I added all of it. But you can decide how much of the taco meat you want to stir in and if you have any leftover, save it to make a quesadilla or tortilla pizza for lunch. Or you could make more than 4 potatoes and increase the amount of sour cream and milk you use. To finish these potatoes off and give them even more spice, I put some Del Viejo Salsa on top. This is a fresh-tasting, spicy salsa produced by a small business in St Augustine Florida. They claim to make the world’s most unique salsa. What makes it unique? They use Datil Peppers, which are very rare but can be found in St. Augustine. They are small, yellow peppers about 1 to 4 inches long and are similar in heat to the habenero pepper but also have some sweetness to them. They even have a Datil Pepper Festival in St. Augustine to celebrate the uniqueness of this pepper. I love the heat the peppers give Del Viejo Salsa. It’s strong, but doesn’t burn and doesn’t camouflage the other flavors. 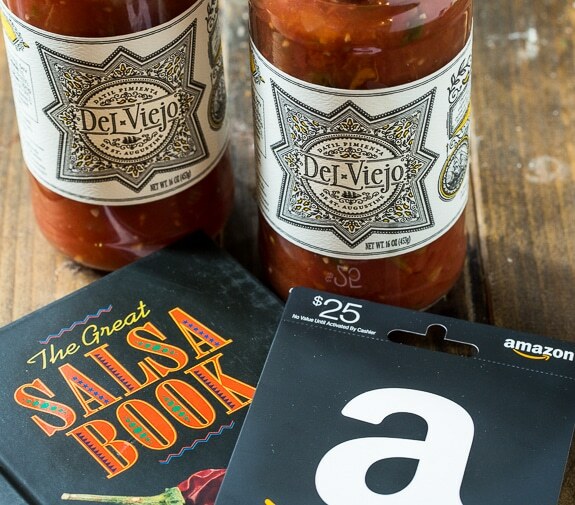 If you’d like to try your own Del Viejo Salsa, you can order some from their website and be sure to enter the Giveaway below for your chance to win 2 jars of salsa, a Salsa Cookbook, and a $25 Amazon gift card. Watch the video below to see how easy this recipe is! 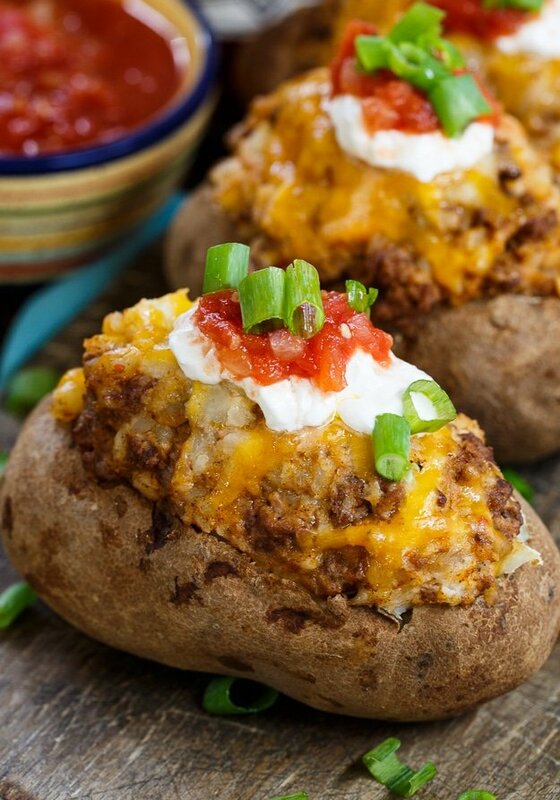 Double Stuffed Taco Potatoes are loaded with ground beef taco filling, onion, sour cream, and cheese. A sprinkling of chopped green onions and salsa finishes them off. Meanwhile, cook ground beef and onion in a nonstick pan until beef is cooked through. Break it into small pieces with a wooden spoon as it cooks. Once potatoes are baked, let cool 10-15 minutes and then remove a sliver of skin from the top of each potato. Scoop potato pulp out and place in a large bowl. Add sour cream and milk and mash until smooth. Stir in about 3/4 of taco mixture. If you feel like there will be too much meat mixed in if you add the remaining 1/4, save it to make a quick quesadilla or tortilla pizza for lunch. Or go ahead and mix it in. Fold in 3/4 cup of cheddar cheese. Stuff the potato mixture back into the skins. Place in a baking dish. Sprinkle remaining cheese on top and bake at 350 for 20 to 25 minutes. Giveaway is open only to US residents. Must be 18 or older. One winner will be picked and notified by email. Winner has 48 hours to respond or another winner will be chosen. I provided with free product, but this is not a sponsored post. I love the opportunity to share exciting new food products with you. This entry was posted in Dinner, Main Dishes and tagged Mexican, potatoes, Tacos. Bookmark the permalink. These potatoes have become a family favorite! Ummm is it even possible to cook potatoes at 475? They would burn after like 30 mins! I never turn my oven temp higher than 400 degrees unless I’m broiling something and I can do that at 400 degrees. I understand wanting to cook so many potatoes at once for a shorter time, but that sounds dangerous. I love my salsa really super hot! But having to think of others in the house….. usually i have to go with mild. Sad. I like it extra spicy! I really like it mild. Thank You for the giveaway…we like salsa with a bit of heat i.e. Hot ! I like my salsa really hot. Most definitely mild for moi! I like my salsa mild! I like really hot salsa. I like my salsa hot but usually resort to mild so my daughter can eat it as well. Love it anyway it’s served to me! I love it really hot, but these days, my stomach can only take it hot somtimes and mild all the time. I prefer hot when in recipes and mild when eating it on chips. I like my salsa really hot!! I love my salsa mild! I’m in the hot salsa club! I like my salsa HOT! I love pretty much anything hot as long as it’s not super hot. I like it mild to add to the taste of the food only. I like my salsa mild. The milder the better lol. My husband and I like it mild. Our grown boys like it hot. I like all kinds of salsa except super, super hot. I like my salsa mild. I like a mild salsa. I like my salsa mild!!! Hot but not so hot that I can’t taste any other flavors. I like my salsa medium to hot, but not too hot. Mild is too sweet for me. I love hot salsa! Mild is fine too, and so is super hot, but I don’t like the really painful kind of hot. So..a nice medium is hot is perfect. Thanks so much for the opportunity to win! I like a really nice medium salsa! I like my salsa mild and chunky. I usually like it mild but there are times when hot is good. I like my salsa hot, just not my mouth is on fire hot. I like my salsa hot or very hot. Thanks for the giveaway! I like my salsa hot! Thank you!! I like mild or medium salsa. My husband likes hot. I usually prefer my salsa hot, it makes all the other flavors arise! Looking forward on getting the book! i would LOVE to get all those recipes! I like my salsa hot. I like mine mild to medium. I could eat chips and salsa all day. I like my salsa hot! Not too hot that you can’t even enjoy it, but hot is good. I like my salsa hot, but not so hot that I can’t taste the food it goes with. Hot is as far as I go! I like mine more on the medium side. Thanks. Mild would be my choice of salsa. I really really love hot salsa over the rest. Would love to get the book to pump up my recipes! I like it hot, mild, and in-between, as well as made with all sorts of ingredients. My name is Marty and I’m a salsaholic. I like my Salsa hot! I like mild salsa but hot hits the spot every once and a while. I like mild salsa, with tons of fresh cilantro. I prefer mild salsa, but others in this household enjoy hot salsa. I like it really hot. So hot my eyebrows sweat and my nose runs. I like my salsa fairly hot, unlike my other 1/2 who just bought salsa at the farmer’s market made from Carolina Reapers, currently hottest around. Mild is best for me. I like my salsa medium. I prefer a little heat so I go with medium. I’d pick hot but some varieties get too darn hot! I like to have my salsa hot. I like my salsa medium hot. Yum, there nothing like fresh Latin flavors coming together in salsa. I’m more of a mild/medium spice girl and could use this on my numerous taco Tuesday dishes. I like my salsa “really hot”! I like my salsa hot! Thank you for this opportunity, good luck everyone! I like my salsa mild. Thank you for the giveaway! I like my salsa mild, but my hubby likes it hot! Thanks for the opportunity! Great Giveaway! i like my salsa really hot! I like my salsa mild. Not a fan of hot salsa. I prefer mild, I can’t really handle food that’s too spicy. I like it hot, but not to hot! I like a medium salsa. I have to stick with mild these days. I like it about medium. I like a little bite in it but not so much I can’t eat! Really hot! Love the heat and flavors! I like it hot, but not TOO hot! I like my salsa hot, but not too hot. The taco potatoes sound delish! Thanks for sharing the recipe and for a great giveaway..
For most salsas, I like them hot. Most, when they say hot, they are not that hot. But if they are, I switch to medium. I like my salsa hot but not super hot, so maybe medium hot? I like mild and hot salsas, depends on what I’m craving. Thanks! I like my salsa mild to medium. I love salsa somewhere between hot and medium, usually have to mix it. But whatever, I love it. These look amazing!! I like my salsa hot. Not too hot that it’s not enjoyable, but a good heat. 1 mild (for me) and 1 HOT for my husband. Picante! Some like it hot, and I’m one of them. I love mine Really Hot!!!! I like it somewhere between mild and hot! My husband likes it really hot, though! HOT! Of course… although “Very hot” usually means habanero or scotch bonnet peppers, and they are just overwhelming, especially for flavor. I prefer mild salsa but I will eat medium as long as it is not too hot. I like it medium not too hot. I like my salsa really mild. Probably why my nickname is JalapenoMama! I live in Texas. I like my salsa really hot! I like my salsa mild to medium, a little kick but not painfully hot. I would love to try the medium salsa. Thanks for the chance to win. I like my salsa on the mild side. I can’t handle spicy and/or hot foods. We like hot salsa…though, I think Hubz would go for extra smoking hot. I love mild salsa most of the time. Sometimes, I like a little bit of spice in my salsa. I love hot salsa, not too hot, just something that leaves a little heat after a bite and not to the point my eyes are tearing up. I like mine on the medium side. I like my salsa mild for the most part. I like my salsa medium. Nothing too hot or mild. My kids and I usually eat mild or slightly hot salsa, but my husband enjoys his SUPER hot! These double stuffed potatoes look incredible, Christin! Love the taco filling! Such a great idea! I like hot, but usually get medium if I’m with a group. I like my salsa mild, so I can continue to taste. I just like regular mild salsa or possibly medium. I’m not too keen on red hot stuff. I like my salsa mild. I can’t handle the hot. lol thank you! i like my salsa mild. i am a wuss when it comes to spice. I like it hot but not too hot. I tend to like my salsa on the mild side. Thanks for the chance to win. I usually go for the really hot salsa. The hotter, the better! Those potatoes look so good! 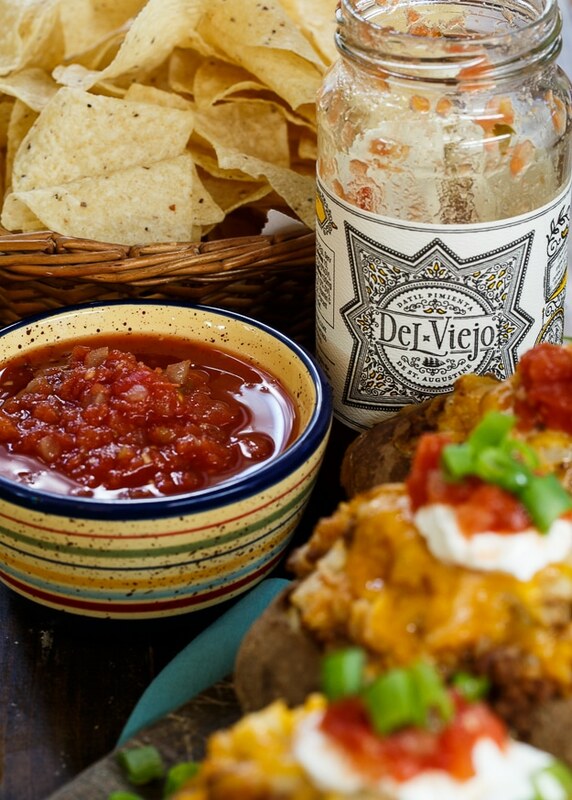 You just cannot go wrong topping potatoes with Mexican flavors. I like my salsa Medium or Mild. I am too much of a wimp to go hot. I like it hot enough that my eyes and nose run! I like medium hot salsa. I want some heat, but don’t want so much that it over powers everything else. I am a medium fan when it comes to salsa. I like my salsa hot!! Not SO hot that you can’t taste the flavors, but I definitely like a kick! These potatoes look so yummy! HOT Salsa for me. Very hot if I’m only having bad tasting chips! I’m loving these Mexican style potatoes! This is such a great idea! These potatoes look amazing! I can’t wait to try this recipe. We like our salsa hot when using in recipes and mild for dipping!! Is there anything better than a big stuffed potato?! I love this! Wow these potatoes are stunning, Christin! I absolutely LOVE that they’re stuffed with all of the goodness of tacos! Sounds like the perfect dinner to me! These looks great! I like medium heat salsa. Holy moly- those look absolutely delicious. I would have to say I like my salsa mild! Salsa has always been my favorite! I like mine medium to hot. 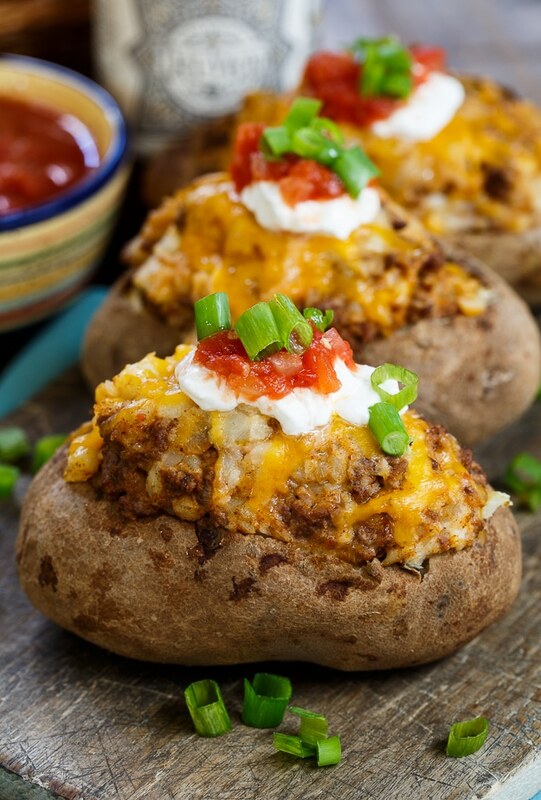 I love twice baked potatoes, and this looks like such a delicious upgrade! As far as I’m concerned, you could mix dirt into a baked potato and it would taste pretty darn good. Taco filling is even better, though. This looks fantastic! I love a good, loaded potato! All the flavors in here look amazing! I’m a wimp when it comes to peppers so I like mine nice and mild! Oh Yum!! I love the idea of stuffing potatoes with taco filling. What a GREAT idea!! I like very hot salsa on cold foods like chips, but on warm foods, like tacos or burritos, I prefer it not as hot. Taco potatoes?! That has to be the coolest thing ever! Love love love this recipe! My husband would go nuts, he loves mexican and who doesn’t love potato?! I like my salsa in between, so I would say medium! I like my salsa mild, so that I can add heat with other ingredients.